Parenting for Non-Violence was recognized for its commitment to providing parenting education/enrichment programs to parents of children who reside in at-risk communities. Although parenting is the most important and demanding job anyone can have, it receives little support or recognition in our society. Parenting for Non-Violence supports parents dealing with these challenges and stresses and helps them prepare their children and teens to survive and thrive in the society in which we live by providing information on how to keep their children safe along with proven skills for effective, peaceful problem solving and relationship building. This work leads to happy, successful, hopeful, resilient children and productive, thriving adults. Mohammed Zaher Sahloul was recognized for his selfless and courageous delivery of medical relief to refugees in Syria and other disaster areas. Dr. Sahloul has risked his life leading the Syrian American Medical Society in providing medical relief to help the civilian population in his homeland of Syria, especially in devastated Aleppo. He also has conducted medical missions to Puerto Rico, Yemen, and Rohingya refugees on the Myanmar-Bangladesh border. Dr. Sahloul is a co-founder of MedGlobal, a medical NGO that addresses global healthcare disparity and to provide medical relief in disaster areas. He serves on the advisory board of the Syrian Community Network and of the Center for Public Health and Human Rights at the Johns Hopkins University Bloomberg School of Public Health. The Interreligious Leadership Awards reception was graciously hosted by Jenner & Block LLP. 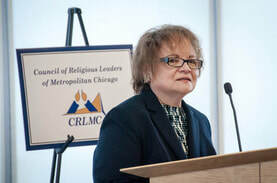 On June 16 members and friends of the Council presented the 2016 Interreligious Leadership Award to three distinguished honorees: SWIFT (SouthWest InterFaith Team), a coalition of synagogues, churches, and mosques located in the south and southwest suburbs of Chicago for promoting dialogue and developing mutual respect and understanding among different religious communities; Dr. Rami Nashashibi, Executive Director of IMAN (Inner-City Muslim Action Network), for his diligent work for the well-being of Chicago's inner city; and Mr. F. Oliver Nicklin, is a leader in business and education, for his efforts to promote interreligious understanding and respect among the Jewish, Christian, and Muslim communities of Chicago. Pictures from the evening can be found here. On November 25, 2015 the Council of Religious Leaders of Metropolitan Chicago held its annual interfaith Thanksgiving observance at the Chicago Temple. The theme of the event is "unity hope and peace". The event works as a way to bring those from all different faith communities together for a prayer of thanks. This year there were fourteen different groups that offered a form of prayer or music during the event. There was also a collection for donations to provide holiday meals for those in need. For more images from the event click here. 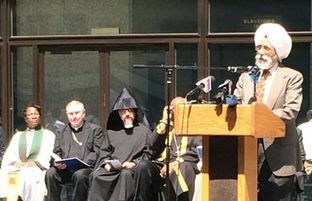 The Council of Religious Leaders of Metropolitan Chicago’s “Celebration of the New Year – A Festival of Faiths” was held on Sunday, September 20, 2015. 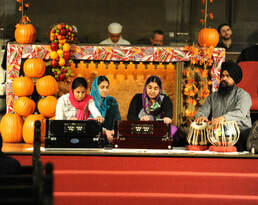 The event highlighted how different faith communities celebrate the New Year. Six faith communities (Buddhism, Catholic Christianity, Islam, Judaism, Orthodox Christianity and Zoroastrianism) explained their celebration and provided music that reflected their observance. Dr. Hansra of the Sikh Religious Society offers a prayer. 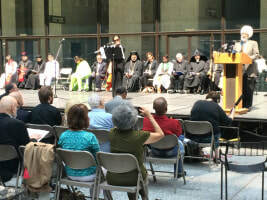 On July 31, after a moving prayer service last August, the Council hosted another "Prayers for Peace" service in Daley Plaza. With all of the violence and tragedy in our world, the service was an opportunity for people of all faith communities to come together and offer up prayers for greater peace and love in our world. 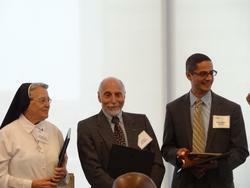 On June 11, the Council of Religious Leaders held the second annual Interreligious Leadership Awards. This year, the Council honored four individuals- Talat Othman, Pastor Chris Harris, Rabbi Michael Seigel, and Father John Kalomas representing the Greek Orthodox community of St. Andrew's. These awards are a way for the Council, which this year is celebrating its 30th anniversary of work and presence in Illinois, to recognize and give thanks for particular individuals, programs, or organizations that embody the Council’s own purpose of promoting religious harmony for the sake of the common good. On March 19th, Life Matters Media and the Council teamed up to host an Interfaith discussion of religious and moral principles regarding end of life. The discussion consisted of six different speakers from six different faith traditions and the event was hosted by Northwestern University. 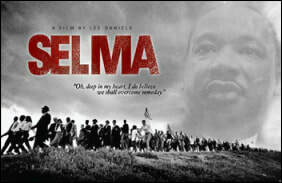 On March 12th, three days after the 50th anniversary of the historic “Bloody Sunday,” in which men and women attempted to march from Selma to Montgomery on behalf of Voting Rights, the Council of Religious Leaders of Metropolitan Chicago invited guests to view the movie SELMA and get to know some first-hand witnesses of the event. The movie was viewed at the beautiful Pickwick Theater. 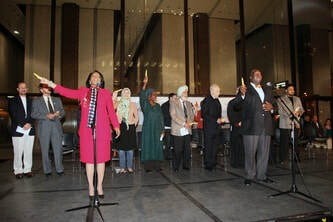 Created by the United Nations on October 20, 2010, after being proposed by H.M King Abdullah II of Jordan, Interfaith Harmony Week has quickly become a major worldwide movement. Look below to read reflections from prominent religious leaders from 7 different faith traditions in metropolitan Chicago, in celebration of World Interfaith Harmony Week. Shayda Safapour (Baha'i): To read her reflection click here. Rohinton Rivetna (Zoroastrian): To read his reflection click here. Communities of faith lifted up the lives of undocumented immigrants in their prayers, readings, reflection and education during at least one Sabbath service as a way to increase understanding of the difficult circumstances that many immigrants face, but also their hopes and contributions to our communities, in an effort to build support for immigration reform that protects family unity and provides a pathway to citizenship for all deserving undocumented immigrants in our country today. Anita Alvarez speaking @ the Dec 4. Retreat about human trafficking. The Honorable Anita Alvarez, State’s Attorney for Cook County, gave a presentation on human trafficking. Chicago, because of its strategic position and the number of conventions held in the city, is third most popular city for human trafficking. She approached the problem from the point of view of the county prosecutor. Cook County is presenting a new approach to the issue, which has already served as a model for other cities throughout the country. The city's approach is to decriminalize juvenile prostitution and collaborate with all partners from law enforcement and social services to focus on victim recovery. Ms. Alvarez indicated that the best way for faith communities to help is to raise awareness of the problem, as well as providing housing for the victims. With major conflicts emerging in Ferguson, New York City, and in many areas throughout the globe, men and women from 17 different faith traditions came together to pray for peace, hope, and unity. 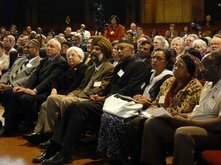 This interfaith gathering was held at the Chicago Temple- the home of The First United Methodist Church. During this event, men and women of different faith traditions had the opportunity to offer prayers, music, and words of wisdom during the holiday season. It was wonderful event for all those who attended. Click on the image to go to the album page.